ProMinent has been known for decades as the market leader in the low pressure diaphragm metering pump segment, but has also been establishing itself for many years as a provider of process metering pumps. The investment of around € 500,000 in a new pump test bench enables ProMinent to ensure product quality and undertake further development - even in the highest performance ranges - and test performance profiles adapted to specific applications and customer specifications according to the state of the art. 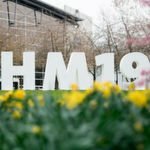 ProMinent can now also test pumps to meet API 675 guidelines (American Petrol Institute guidelines for oscillating displacement pumps for use in the crude oil, chemical and gas industries), thereby ensuring that process safety is guaranteed when metering and handling flammable, toxic, solids-laden or highly viscous fluids. 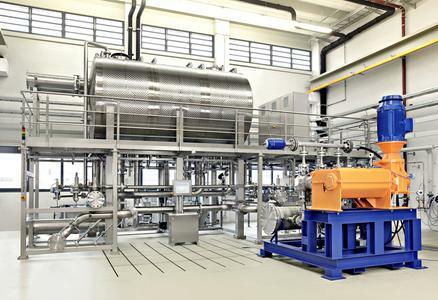 The new test bench for process pumps became operational in Heidelberg at the start of 2011. Manufactured throughout from stainless steel 1.4301, the test bench comprises two independently operated test stations, each of which is equipped with a centralised power supply, monitoring equipment and a supply to the test bay. A computer integrated in a console controls and parametrises the individual components of the test bench, enabling the test bench to be operated centrally. All of the requisite parameters inputted are monitored, analysed and documented by an operating data collection system. All process pumps with a motor capacity of 0.37 to 90 kW with 400V and 5.5 to 160 kW with 690V can undergo variable performance tests. A hydraulic line is supplied to the test pieces for this purpose and, depending on the type of pump and any customer-specific requirements, the pumps transport a certain volume of water against a back pressure that can be set by the operator. The measuring range for the flow ranges from 20 l/h to 90,000 l/h and the measured value has an accuracy of 0.1% right across the given range. 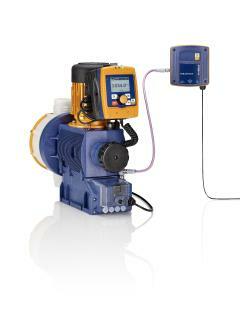 This is guaranteed by the use of high-precision Coriolis flow meters. An exceptional feature of the new test bench is the metering medium used: ultra-high quality water, treated in an environmentally-friendly way according to the state of the art and permanently monitored. A made-to-measure water treatment plant, designed and manufactured in ProMaqua's in-house plant engineering department, guarantees that the pumps to be tested are fed with a medium with a high degree of purity. The top-up water is treated by reverse osmosis and is post-treated with ultra-low conductivity to generate permeate (demineralised water), thereby complying with the limit values for chloride and eliminating contamination by deposits of lime. During operation, the water in the test circuit is continuously filtered during the test and the differential pressure is monitored to ensure that contamination can be identified at an early stage, allowing any contamination that occurs to be reliably removed. The water is then disinfected and cleaned using ozone, thereby helping to protect the test bench against possible contamination. The water quality is continuously monitored by measuring the conductivity, pH value, redox potential and turbidity and the pH value is automatically regulated. The water quality and all relevant operating parameters are documented throughout the entire test procedure. The water is stored in a 30,000 litre stainless steel tank positioned above the test bays and is cooled externally with pillow plates to ensure a constant water temperature. 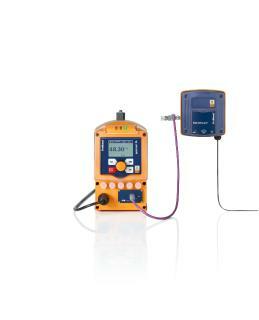 The new process pump test bench from ProMinent is designed to comply with the state of the art. Data is automatically generated for each pump being tested and specific test documents are produced. Complex water treatment processes developed by ProMaqua ensure a constant quality of water - the basis for reliable test results. The test bench means that pumps can undergo performance testing with high-precision accuracy at maximum volume and maximum operating pressure. Additional tests, such as pressure testing, performance characteristic lines and tests to comply with API 675 can be offered to customers, depending on their requirements, and a high level of flexibility can be ensured, thanks to the option of parallel testing. solutions ProMinent provides more efficiency and safety for their customers – worldwide. 56 own sales and service companies and representations in another 100 countries guarantee worldwide service and availability. In 2010 ProMinent celebrated its 50th anniversary. 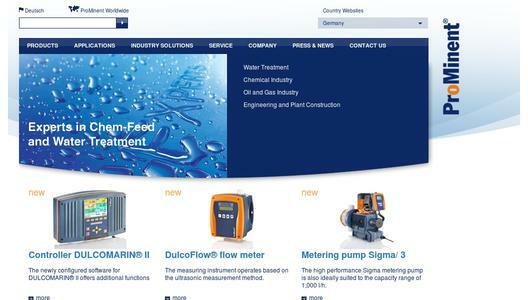 To meet the special requirements of specific customer groups, a new subsidiary named ProMaqua was set up in 2006.
pumps, metering pumps, instrumentation for monitoring, measurement and control, complete metering systems and polymer preparation systems.